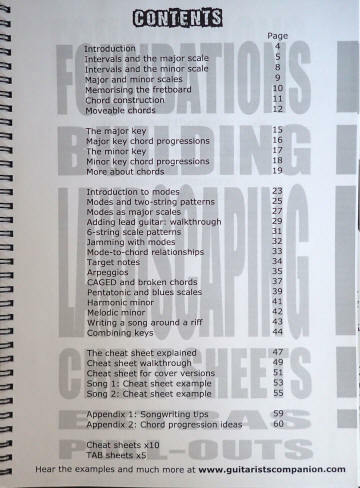 The Guitarists Solo & Song Writing Manual is Great Value... but is it really showing me how modes work? 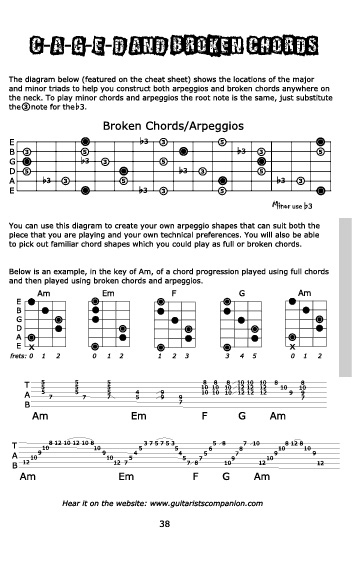 and what about those cheat sheets for guitarists? If you're anything like me then you might well have problems learning the technical aspects of reading music and understanding the things like modes or even for some guys simple song layouts or how to create effective key changes. Then there's the more regular stuff like simple scales, intervals and more. I was walking around a guitar show in Birmingham England last year (was it really that long ago?) and noticed a couple of people manning a stand that had a book for sale on it. 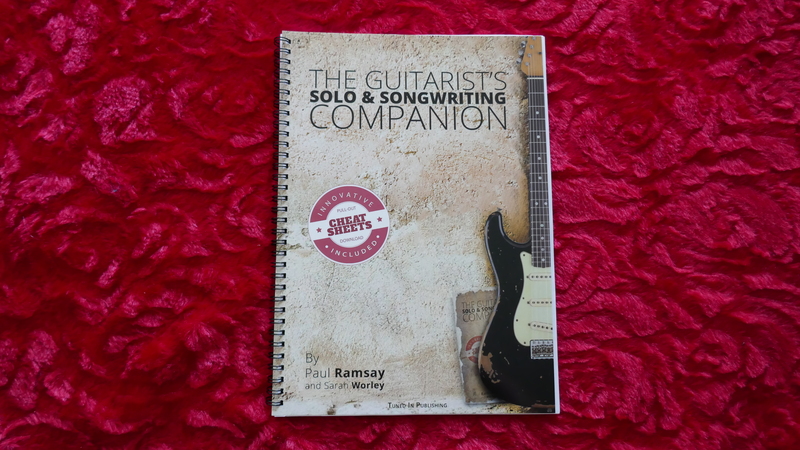 When I asked about it, Paul Ramsey and Sarah Worley were quick to tell me the advantages of their masterpiece - 'The Guitarist's Solo and Songwriting Companion' and it had (as often things do) a special reduced price from the normal £12.99 ($15) cost that it normally retails for. So I decided to buy one primarily because of the way that the book described easily the modes and a huge number of other useful stuff hidden in the pages. Nice. 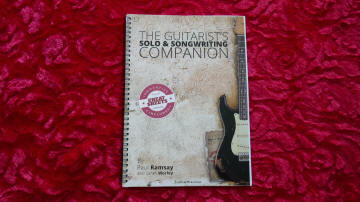 Their website is at: www.guitaristscompanion.com so check it out. It's a 60 page book so it can't cover much right? Actually you would be wrong. Here's an example of what's between the sheets (no, not those sheets) in the book. Wow, there really is a lot in there for just those 60 pages or so. So I guess this book could skimp over the important bits and be hard to use? Wrong! In fact this companion is a very simple book to use. I personally don't get on with most books about theory however presented but this one makes things so simple I can bet there is nothing out there that offers a better simpler more effective way of gaining this knowledge than this companion book. While the companion shows everything above like intervals, major and minor scales, remembering the fret board notes, how to construct chords and moveable chords, major and minor keys and progressions once I go to the modes section I could not really believe how easy that was and how long I (and I'm sure many others) had struggled to properly understand them. 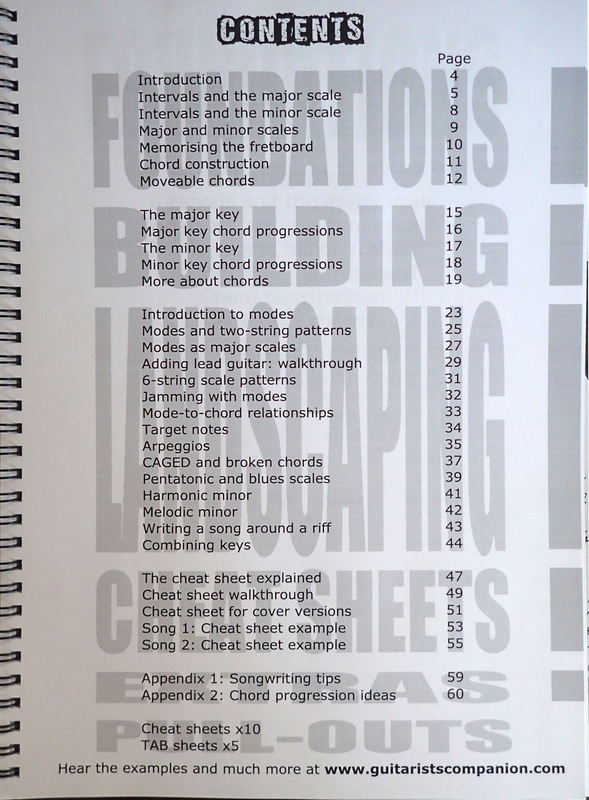 But there is so much more to this book that I have it permanently in the studio as a reference for some of the other inspirational subjects like scale patterns, mode to chord relationships, target notes, arpeggios, even pentatonic scales if you're not familiar with those (you should be!) and so much more. One of the secrets inside the companion is the 'cheat sheet' which I find to be a very useful tool when working out new stuff. And believe it or not that is just ONE sheet - the cheat sheet. There are 10 cheat sheets included in the book, but you can also download a 'master' cheat sheet that you can use forever. I found this cheat sheet to offer most of the stuff I just might want on hand when in the studio on new stuff or just improvising from the things covered on this sheet. 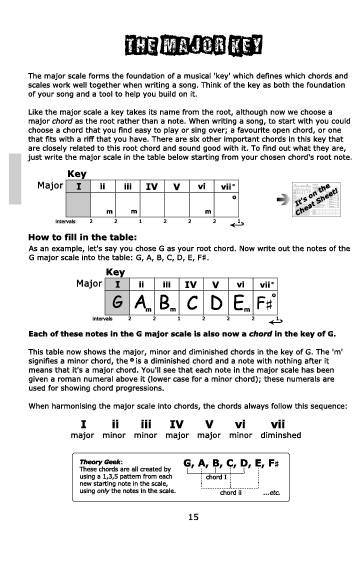 As you see from the page above this section relates to the major key and as some might know that typically the positions of the scale are used to develop songs with patterns such as I IV V and so on. In any case, the above is pretty simple to understand but without that knowledge you will be at a disadvantage probably when writing music... it's almost like trying to reinvent the wheel if you don't know this stuff. Here's another and last (alas) page I can put on this review for copyright reasons. This one covers CAGED and broken chord progressions. There are in fact two pages on this subject, the page above and a second one showing the c-a-g-e-d methods of playing. I have seen (and have) whole 50 page books on the CAGED method (not to mention loads of videos) that could be confusing, but these guys keep it simple so most ordinary guys without oodles of technical music theory can understand it easily. And that's the essence of the whole book. So bearing in mind all of that stuff I rate this book at an 8 out of 10. Why not ten? Well overall this book is great for many guitarists to learn the theory behind the music. But some guys simply don't want to know any of it and just play other peoples music. Obviously the book COULD help those guys to understand what they are actually doing... but often they may not want to know. It's not the fault of the book though that's a fact. But that area is one section I thought was 'missing' from the book by 'heading'. Its true that everything is covered, but a specific heading would have been nice to 'add' to what is nigh on one of the best books around to teach you loads of stuff including those often baffling modes. But trust me on this an 8 out of 10 is a quite incredible score for a book especially from me. When I first saw the book on the show stand I took a quick look and wandered off around the show. But ultimately I went back there... and I'm glad I did because this book has really helped me to understand stuff that otherwise I might have remained in awe of for a long time and never really 'got my head' around it as I did by using the guitarists solo and songwriting companion as I did. It has helped me with song structuring, modes and some other stuff like modulation between keys etc. which is amply covered in this book. If it can help me then there is no doubt that it will help you to get to grips with those musical theory aspects that you just can't grasp. What a great book! Buy it! All images on this page are copyright Tuned in Publishing. This review is NOT a paid for review and I did not gain whatsoever from making this review in any way. It is a personal opinion as indeed all my reviews are.